Few residential remodeling projects possess as much transformative power as new flooring does. Your flooring is a huge contributor to the overall look and feel of your living space. So if you want to give your bathroom, bedroom, or living a substantive makeover by replacing aged or worn floors can breathe new life into your interior design. Local homeowners know to visit Flooring America when they’re looking for luxury vinyl flooring in Champaign, IL. Shoppers looking for attractive, functional flooring will have no trouble finding a vast selection of vinyl flooring that meets their every need. Our impressive array of flooring materials come in several different colors, patterns, and textures. With so many options available to you, finding the right choice for your remodeling project may be more difficult than you think. If you’re not sure which of our resilient flooring choices would best suit your needs, our knowledgeable specialists will gladly offer their assistance. Trust that we’ll help you find a vinyl flooring choice that speaks to your design vision. At our flooring store, we carry an impressive assortment of luxury vinyl tile and luxury vinyl plank flooring. Our choices come in a wide variety of colors, patterns, and styles. As a result, shoppers will have little trouble finding an ideal material to accentuate their spaces when they step through our doors. No matter what your taste or preference, you’re sure to find a desirable vinyl tile or plank option that speaks to your vision waiting for you in our showroom. Thanks to their unique manufacturing process, our luxury vinyl tile and luxury vinyl plank flooring can replicate the look of real stone and hardwood floors with convincing realism. When you choose these resilient flooring options, you can rest assured your new underfoot surfaces will perform as well as can be expected, even in moisture-prone spaces such as bathrooms and kitchens where traditional wood floors typically wouldn’t fair well. Best of all, cleaning these floors is as simple as wiping them down with a damp mop and sweeping them regularly. 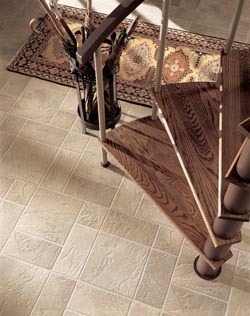 Are you uncertain which of vinyl flooring would best suit your project? Share your remodeling aspirations with our knowledgeable team members and we’ll gladly help you find a quality flooring selection that’s sure to satisfy. Once you’re happy with your choice, our skilled installation will ensure your new flooring is laid down properly. Put your luxury vinyl tile installation needs in the hands of our skilled flooring specialists and we’ll ensure that your new solution is positioned precisely. Rest assured, our professionals will leave you with a new floor that will continue to impress long after it’s been installed. Contact our flooring showroom to find the perfect luxury vinyl floor for your project. We proudly serve home and business owners in Champaign, Urbana, Mahomet, Lake of the Woods, and Augerville, Illinois, as well as the surrounding areas.